Goddess Rising Yoni Crystals are precious stones, rare in nature and carefully selected for their energetic healing qualities. Our crystals are safe for internal use, sustainably sourced, hand-carved, polished and blessed to ensure the best for you and your yoni. Clear Quartz is the most programmable of all crystals. This powerful stone is helpful when wishing to amplify intentions, attunement to higher self in connection with your Wombspace and strong clarity of mind with the ability to clear, release or store specific energies. A stone of the Great Mystery, Smokey Quartz is known for its strong detoxifying, grounding and cleansing properties. Helpful when needing to balance the spiritual, mental & physical, clears shadows from the womb while offering psychic protection! For self-love, to release anger, heal heartbreak, & activate forgiveness. This stone is helpful when wishing to access deeper levels of self-kindness & self-trust. Powerful tool for self-love rituals! For use during particularly improved womb / spirit communication, creativity & accelerating intuition & feelings of peace. Helps you open up enough to say what needs to be said. Accelerates womb healing on all levels, supports fatigue. Connected to the energy of Goddess Quan Yin and is deeply healing and rejuvenating to your womb. Jade is a protective stone traditionally used in this yoni egg practice for thousands of years to balance the yin & yang womb energies (left and right ovaries). Open & heal heart chakra, balancing. A root chakra stone to remove deep seated negativity and be wrapped in psychic protection. The Silver Sheen resembles the Cosmos and connects reminds you of your Divinity and place within all life. Can also be used for “womb scrying” and in journey work & deep meditation. This stone is often associated with Pele pulling out any & all energies that no longer serve you. The Rainbow reminds you that even in deep shadow work the light is always there guiding you forward. For deep womb cleansing, clairvoyance, love & self-growth. The Golden Sheen is also known as the ‘Shamans Stone’ for it’s capacity to pass the bearer wisdom, cloaking you so your magick is safe & protected. Helpful when in situations where you need to release the ego, energy balancing, root chakra work, and helpful to bring miracles into your life! 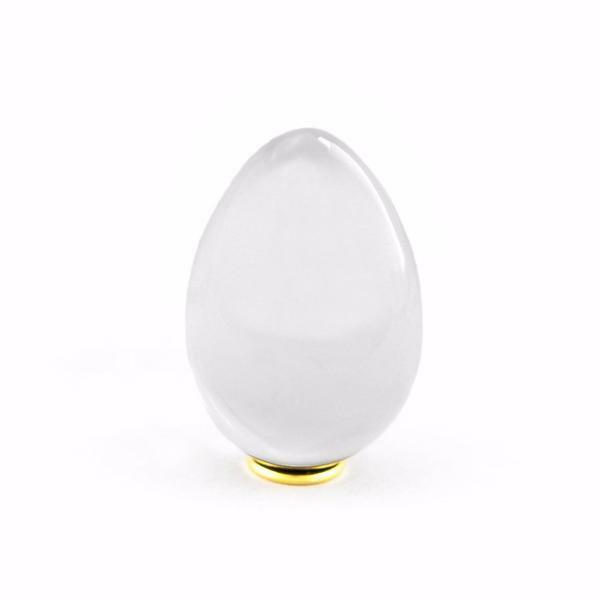 If you are new to Yoni Eggs, we recommend beginning with a medium sized Jade, Moonstone Quartz, Clear Quartz or Star Rose Quartz. Obsidian Eggs have a powerful clearing effect on the womb and best for those with an already established practice. All Yoni Crystals are drilled *except* when otherwise noted. All Obsidian Eggs come undrilled. This special set includes 3 Yoni eggs: 1. Star Rose Quartz 2. Nephrite Jade and 3. Rainbow Obsidian. Rose Quartz and Jade are drilled, Obsidian is undrilled. Available in sizes small, medium and large. This special set includes 3 Yoni eggs: 1. Nephrite Jade 2. Obsidian Sheen and 3. Rainbow Obsidian. Jade is drilled and the Obsidians are undrilled. Available in sizes small, medium, and large. The Yoni Wand is designed for sensual/ healing yoni massage. You have contact with the crystal while it's inside if you—making it a powerful tool to access your pleasure areas. Available in straight or curved. This essence (for internal use) was collected by Achintya at the Isis Temple, under the stars on the isle of Philae, Egypt. The Love of Isis is imbued in this essence to support your unique journey of spreading your angel wings & rising in your Ancient Future Feminine Power. You'll receive a stock bottle & instructions for making a dosage bottle. You'll receive an audio meditation guiding you to create a powerful ritual and sacred anointing practice with these aromatic Egyptian anointing oils. These oils can activate the wisdom and power within your 7 energy centers and DNA for healing and awakening. This sacred oil set from Egypt honours the the Sacred Union of the Masculine & Feminine, both within your Self and/or in Partnership. They are designed to be used together and are a perfect gift for yourself or a Lover. You will receive and accompanying (downloadable) audio meditation recording guiding you to create a powerful ritual and sacred anointing practice for your self or together with a Beloved. An original and exclusive collaboration of Goddess Rising's Achintya Devi and Nikki Jacoby Jewelry. This large hair comb is designed for you to 'crown' yourself with self-love and hold your hair in place. It is extremely strong and can double as a Goddess Ninja device if ever needed. This essence (for internal use) was collected by Achintya on Dec 15, 2017 at the Isis Temple, under the stars on the isle of Philae, Egypt. The Love of Isis is imbued in this essence to support your unique journey of spreading your angel wings & rising in your Ancient Future Feminine Power. You'll receive a stock bottle and instructions to make a dosage bottle to last you a long time. We are always adding to our shop. Sign up below to be notified.